As the country now knows, suspected mail ‘bomber’ Caesar Sayoc has been caught and arrested. Sayoc, 56, sent 12 suspicious packages to several top Democrats, including Barack Obama, Hillary Clinton, George Soros, and others. Now, Attorney General Jeff Sessions says Sayoc could potentially be charged with five federal crimes and serve up to 58 years in prison – which was later corrected to 48 years. BREAKING: U.S. Attorney-General Jeff Sessions say suspicious packages suspect, Cesar Sayoc, faces five federal crime charges, faces up to 58 years in prison. "Regardless of their political beliefs, that we will bring the full force of law." A fingerprint on the envelope containing one of the mail bombs sent to prominent Democrats nationwide, as well as DNA on two other packages, allowed officials to close in on a suspect, 56-year-old Cesar Sayoc, who was arrested Friday morning. 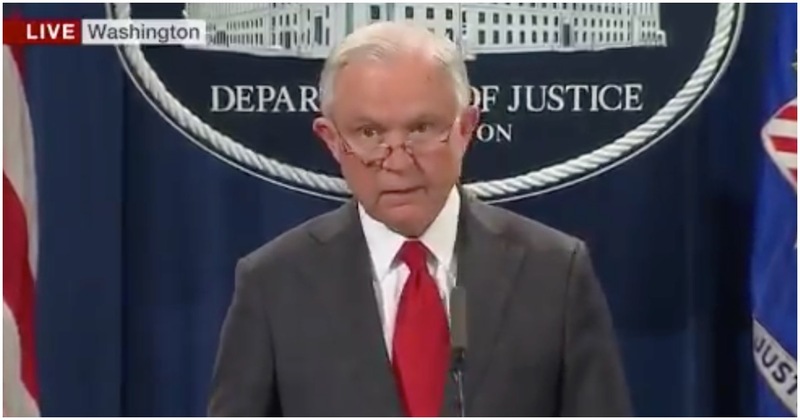 Attorney General Jeff Sessions said in a 2:30 p.m. press conference from Washington, D.C., that Sayoc, from Aventura, Florida, faces five federal charges and up to 48 years in prison. He confirmed the five charges are: interstate transportation of an explosive, illegal mailing of explosives, threats against former presidents and certain other persons, threatening interstate communications and assaulting federal officers. Even though Sayoc was detained in Florida, he will be prosecuted in New York City. “These are not hoax devices,” says FBI Director Christopher Wray. Several law enforcement sources told CBS News that Sayoc was born in 1962. Records show that his full name is Cesar Altieri Sayoc and that he appears to have a criminal history in Broward County, Florida. A fingerprint was uncovered from a package bomb sent to Democratic Rep. Maxine Waters, Wray said. The print was then connected to Sayoc. Wray also said there was a possible DNA connection relating to one of Sayoc’s past arrests. A law enforcement source had said that DNA evidence on one of the devices played a part in leading investigators to the suspect, CBS News senior investigative producer Pat Milton reported.